Arches National Park is home to over two thousand sandstone arches, in addition to a variety of unique geological formations. 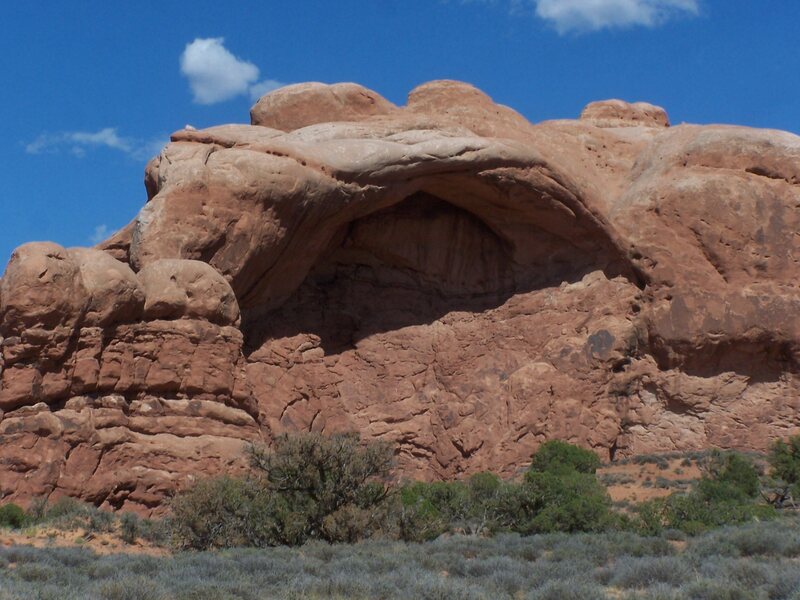 Southeastern Utah is part of the Colorado Plateau (See Canyonlands, Bryce Canyon, Zion, Cedar Breaks, and Grand Canyon, among others), a huge area of the continent that was upthrust millions of years ago. 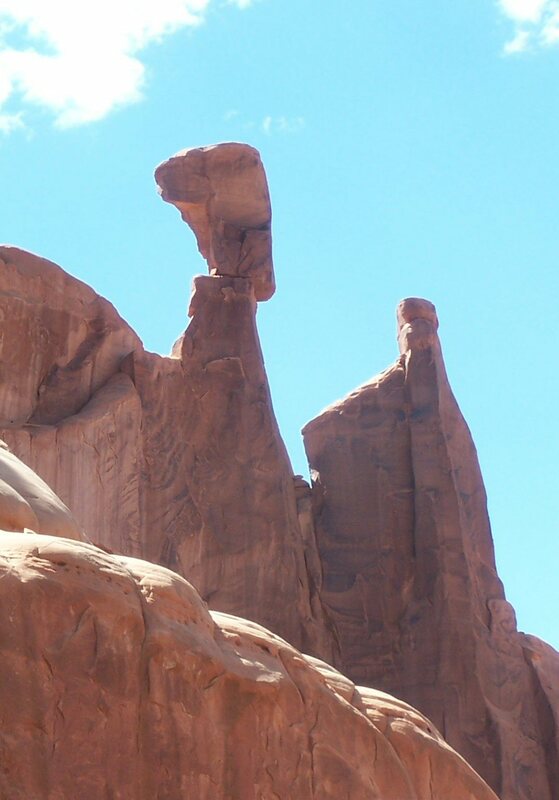 Rainfall, erosion, freezing water and wind have all combined to wear away sandstone that was laid down 300 million years ago. Back in that time, a huge inland sea covered much of what is now central Utah. Over millions of years, debris of salt and sediment was laid down in layers, and eventually perhaps rock a mile thick was compressed. The sea retreated, the faults deep under the earth's surface buckled and shifted, and the land above Moab was pushed high. Then water and wind did their work, eroding the salmon-colored Entrada Sandstone, and the buff-colored Navajo Sandstone into arches and fins and spires. There is much more than rock here in Arches. From April to July, in the right conditions, wildflowers bloom in wild profusion. Now, most mammal species found here are nocturnal, but you might be lucky enough to see kit fox, jackrabbits and cottontails, mule deer, kangaroo rats, and small reptiles. Blue pinyon jays are common, and the lucky observers will see mountain bluebirds and golden eagles. Pinyon and gnarled juniper trees add a splash of green to the reds and tans of the sandstone landscape. 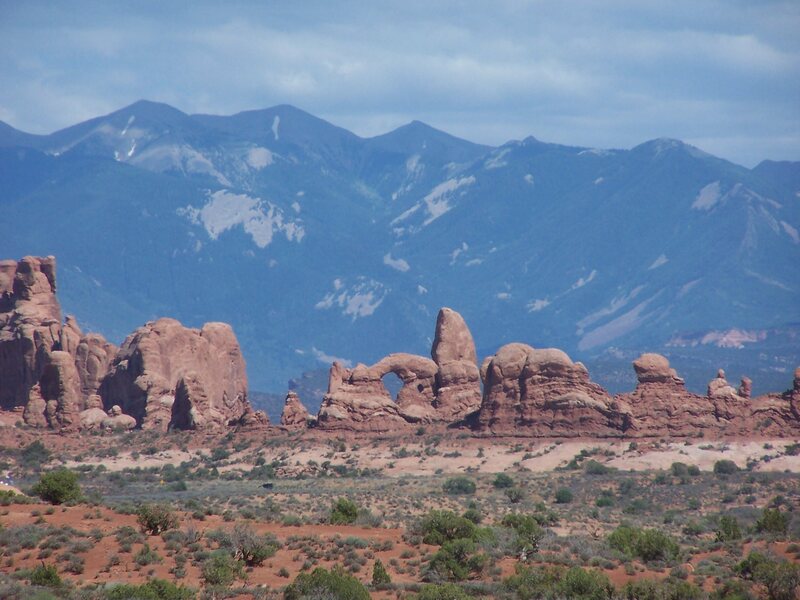 The La Sal Mountains, blue and granite-faced, provide a dramatic backdrop to the sandstone formations. 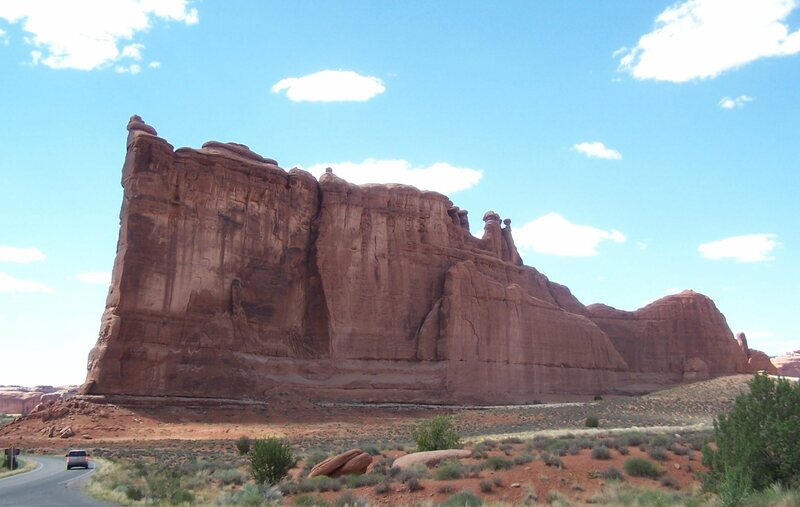 Just like in other Parks in the Colorado Plateau, Arches harbors the famous cryobiotic crust. It's alive, but it doesn't look like it. Composed of cyanobacteria as well as lichen, algae, and fungi, this covering protects against erosion, absorbs moisture, and provides nitrogen and other nutrients for plant growth. This nitrogen is critical, since the soil doesn't provide much itself. That's why visitors are cautioned to stay on the trails, for even one careless footstep can crush the soil, kill the life there, and expose it to the eroding wind and sand. Some theorize that damaged cryobiotic crust can take up to 250 years to regrow. Well, at first, you won't see arches. 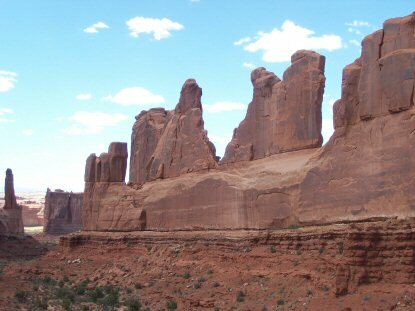 The drive from the visitors center takes guests past many fantastic walls of rock, including one named Park Avenue for obvious reason, and others called Three Gossips, and Tower of Babel. 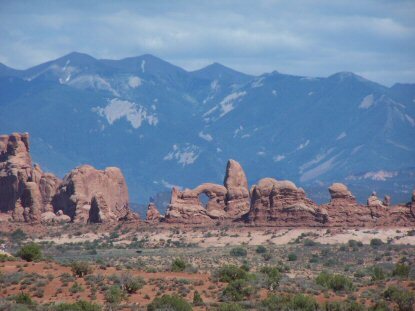 It isn't until one gets deeper into the park that the arches for which it is named become visible. But they are worth the trip! 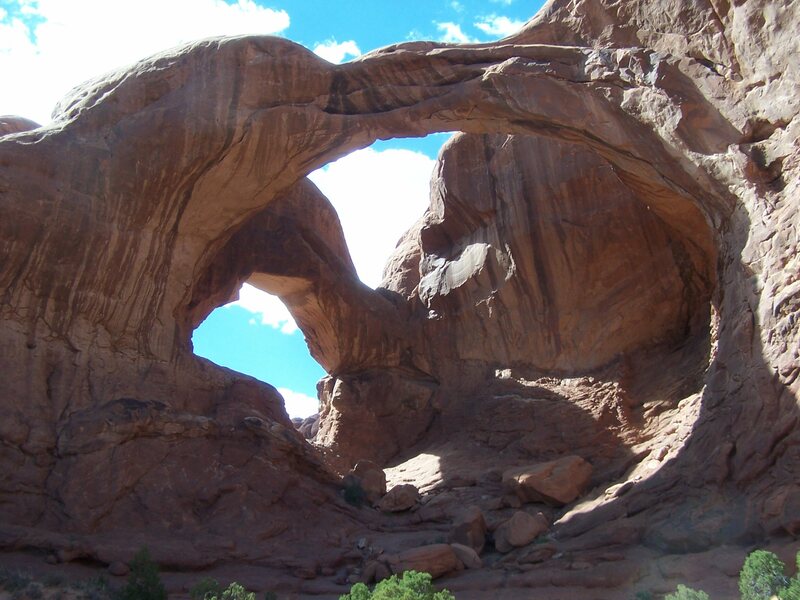 Double Arch (pictured above), North Window and South Window, and Turret Arch are all easily accessed with a short hike from the road. Be sure to read the Visitors Guide -- it contains a list of the most popular hikes, along with information on how to get there, and what to expect. 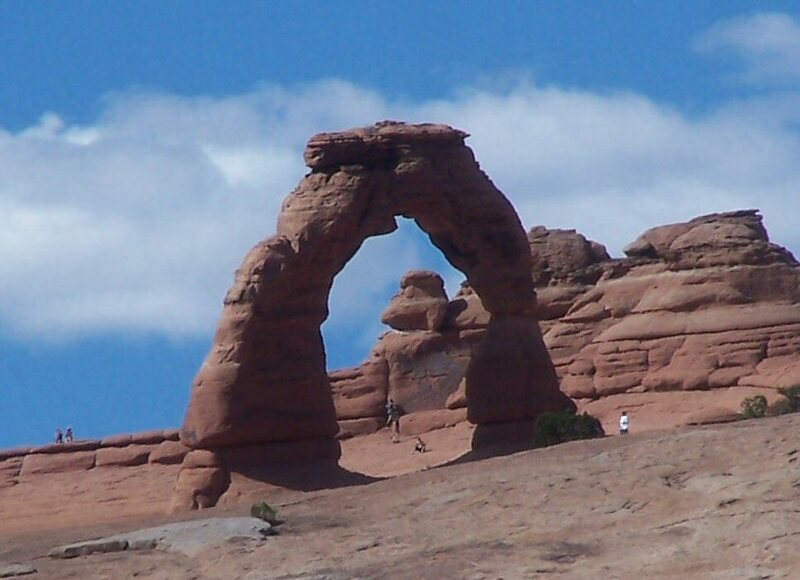 There are many trails to explore Arches, all of different lengths. Some are a few hundred yards, some are several miles long, with differing degrees of difficulty as well. As I write this in the summer of 2004, a completely new Visitors Center is being built. When completed, there will be a large outdoor plaza, exhibits, a 150-seat auditorium, interactive educational kiosks, and bookstore. 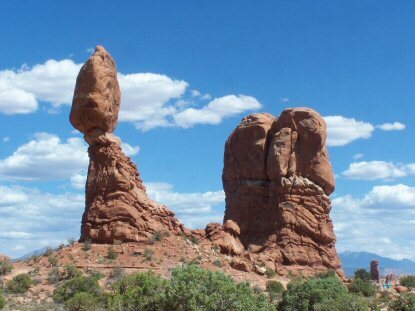 It sounds like that Arches' visitors center will be on par with the excellent ones at Zion and Bryce. The entrance road and stations are already built, though the parking lot is gravel and marked with yellow tape. The current visitors center, a portable room, will become staff headquarters. I was surprised by how uncrowded Arches was. The temporary gravel parking lot was only half-full, and traffic was never a problem on the roads. Perhaps I just got lucky that day in July, 2004. I was also surprised that I didn't immediately see any arches. But the dramatic fins, spires, and walls distracted me immediately -- Wow! The Park Avenue area is a must-see! Sheer cliffs, hundreds of feet high, beautiful colors ... I was speechless. I bet I had a stupid grin on my face for hours. But I came for arches, and arches I must see. The roads took me around to North and South window, very nice, but it wasn't until I got to Double Arch that my jaw dropped. It's HUGE! I can't imagine the natural processes that led to such an awe-inspiring sight. You know, I'd pay good money for a time-machine that displayed the passing of thousands of years in a moment. Watching such a spectacle would be like a dream come true. Don't forget that it's hot in this part of Utah, in the summertime. Take plenty of water with you, whether hiking or not, and stay on established trails. 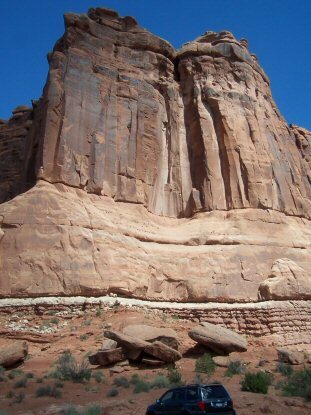 The town of Moab makes an excellent base of operations, and it's five short miles from the Park entrance. When I first saw Moab 20 years ago, it was a fairly sleepy town but already a mecca for slickrock bike riding. There was one hamburger stand that I recall. Now it's grown, and can provide practically every need you'd desire. From Salt Lake City or Colorado, take I-40 to exit 180. Go south on highway 191 for about 30 miles, to the Park entrance. Moab is about five miles further south. 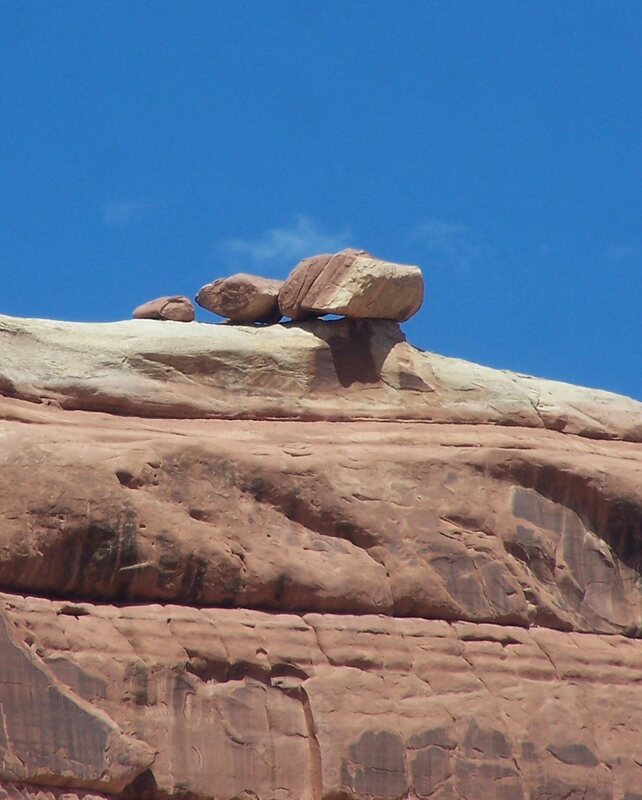 Canyonlands National Park is just a short drive to the southwest, and a little further that direction is Glen Canyon National Recreation Area. Natural Bridges National Monument is a couple of hours to the south and west. Hovenweep National Monument is an equal distance to the south and east, straddling the Colorado border, very close to Canyon of the Ancients NM. North and east, deeper into Colorado, you'll find Black Canyon of the Gunnison NP, and Colorado NM.